Summary: A new study reports brain cells may preferentially activate a copy of one parent’s genes over the other in offspring. Source: University of Utah Health Sciences. Most kids say they love their mom and dad equally, but there are times when even the best prefers one parent over the other. The same can be said for how the body’s cells treat our DNA instructions. It has long been thought that each copy – one inherited from mom and one from dad – is treated the same. A new study from scientists at the University of Utah School of Medicine shows that it is not uncommon for cells in the brain to preferentially activate one copy over the other. The finding breaks basic tenants of classic genetics and suggests new ways in which genetic mutations might cause brain disorders. In at least one region of the newborn mouse brain, the new research shows, inequality seems to be the norm. About 85 percent of genes in the dorsal raphe nucleus, known for secreting the mood-controlling chemical serotonin, differentially activate their maternal and paternal gene copies. Ten days later in the juvenile brain, the landscape shifts, with both copies being activated equally for all but 10 percent of genes. More than an oddity of the brain, the disparity also takes place at other sites in the body, including liver and muscle. It also occurs in humans. Many cells in the brain express two copies of each gene, one inherited from mom and one from dad. Others express just one copy. If the single copy happens to carry a genetic mutation, it may cause the cell to become sick. The discovery from the University of Utah offers a previously undescribed nuanced view of genetics that has consequences at the cellular level. NeuroscienceNews.com image is credited to Christopher Gregg. “We usually think of traits in terms of a whole person, or animal. We’re finding that when we look at the level of cells, genetics is much more complicated than we thought,” says Christopher Gregg, Ph.D., assistant professor of neurobiology and anatomy and senior author of the study which publishes online in Neuron on Feb. 23. “This new picture may help us understand brain disorders,” he continues. Among genes regulated in this unorthodox way are risk factors for mental illness. In humans, a gene called DEAF1, implicated in autism and intellectual disability, shows preferential expression of one gene copy in multiple regions of the brain. A more comprehensive survey in primates, which acts as a proxy for humans, indicates the same is true for many other genes including some linked to Huntington’s Disease, schizophrenia, attention deficit disorder, and bipoloar disorder. What the genetic imbalance could mean for our health remains to be determined, but preliminary results suggest that it could shape vulnerabilities to disease, explains Gregg. Normally, having two copies of a gene acts as a protective buffer in case one is defective. Activating a gene copy that is mutated and silencing the healthy copy – even temporarily – could be disruptive enough to cause trouble in specific cells. Supporting the idea, Gregg’s lab found that some brain cells in transgenic mice preferentially activate mutated gene copies over healthy ones. “It has generally been assumed that there is correlation between both copies of a gene,” says Elliott Ferris, a computer scientist who co-led the study with graduate student Wei-Chao Huang. Instead, they found something unexpected. “We developed novel methods for mining big data, and discovered something new,” Huang explains. The investigators screened thousands of genes in their study, quantifying the relative levels of activation for each maternal and paternal gene copy and discovered that expression of the two is different for many genes. Surprised by what they saw, they developed statistical methods to rigorously test their validity and determined that they were not due to technical artifacts, nor genetic noise. Following up on their findings, they examined a subset of genes more closely, directly visualized imbalances between gene copies at the cellular level in the mouse and human brain. Results from Gregg and colleagues build on previous research, expanding on scenarios in which genes play favorites. Imprinted genes and X-linked genes are specific gene categories that differentially activate their maternal and paternal gene copies. Studies in cultured cells had also determined that some genes vary which copy they express. The results from this study, however, suggests that silencing one gene copy may be a way in which cells fine tune their genetic program at specific times during the lifecycle of the animal, or in discrete places. In addition to Gregg, Huang, and Ferris, co-authors are Tong Cheng, Cornelia Stacher Horndli, Kelly Gleason, Carol Tamminga, Kenneth Boucher, and Jan Christian from the University of Utah, and Janice Wagner from Wake Forest School of Medicine. The study publishes in Neuron as “Diverse Non-Genetic Allele Specific Expression Effects Shape Genetic Architecture at the Cellular Level in the Mammalian Brain”. Funding: The research was supported by the National Institutes of Health, Simons Foundation, University of Utah, and New York Stem Cell Foundation. Image Source: NeuroscienceNews.com image is credited to Christopher Gregg. University of Utah Health Sciences “Brain Cells Prefer One Parent’s Genes Over the Other’s.” NeuroscienceNews. NeuroscienceNews, 22 February 2017. 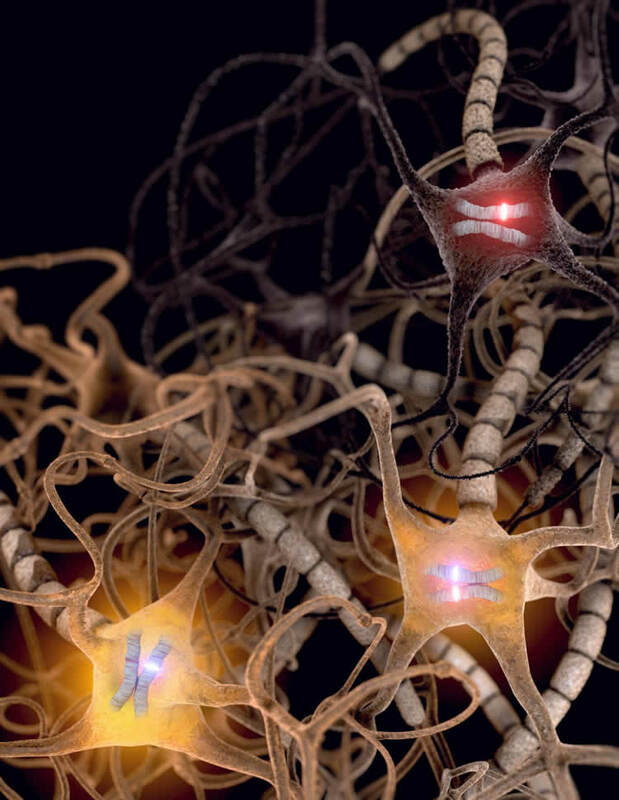 University of Utah Health Sciences “Brain Cells Prefer One Parent’s Genes Over the Other’s.” http://neurosciencenews.com/parental-genes-neuroscience-6148/ (accessed February 22, 2017). Interactions between genetic and epigenetic effects shape brain function, behavior, and the risk for mental illness. Random X inactivation and genomic imprinting are epigenetic allelic effects that are well known to influence genetic architecture and disease risk. Less is known about the nature, prevalence, and conservation of other potential epigenetic allelic effects in vivo in the mouse and primate brain. Here we devise genomics, in situ hybridization, and mouse genetics strategies to uncover diverse allelic effects in the brain that are not caused by imprinting or genetic variation. We found allelic effects that are developmental stage and cell type specific, that are prevalent in the neonatal brain, and that cause mosaics of monoallelic brain cells that differentially express wild-type and mutant alleles for heterozygous mutations. Finally, we show that diverse non-genetic allelic effects that impact mental illness risk genes exist in the macaque and human brain. Our findings have potential implications for mammalian brain genetics.